From Rt. 9 turn onto Route 123. Follow 123 for 4.5 miles to the height of land. Parking is another 0.15 miles on the right. Look for the Pitcher Mountain Tower sign. DESCRIPTION: From the parking area you'll have three possible ascent route options to the summit. OPTION #1 - JEEP TRAIL: The traditional route follows the Monadnock-Sunapee Greenway. Cross the right side chained gate then follow a 4x4 Jeep trail to the summit. The road is an easy grade for the first 0.21 miles then takes a sharp left following the property line of the Faulkner Family Farm. The grade becomes moderate and footing conditions aren't as secure as the Jeep road. After 0.10 miles the trails turns left again and reaches the warden / ranger station at 0.38 miles. From here the fire tower can be seen 0.1 miles up bouldering terrain. The Jeep Trail is marked in red on the map above. OPTION #2 - DIRECT ROUTE: I consider this route be the peakbagger extraordinaire direct route to the summit. From the parking area cross the right side chained gate as mentioned above then look for the trail ascending to the left and directly up the fault line. The rocky path is overgrown and ascends moderately for 0.25 miles to the summit ridge. 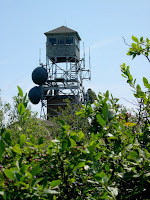 The summit and fire tower can be seen a short 0.3 miles to the East. The direct route is marked in blue on the map above. OPTION #3 - WESTERN ASCENT: For a more gradual and slightly longer hike I would recommend ascending the Western Side of the mountain. From the parking area cross the left side chained gate and proceed along the fire road. Over the 0.26 mile distance the road elevation gains 100 Ft and is very gradual. At 0.26 miles look for a path ascending to the right. The trail ascends moderately for 0.15 miles to the summit ridge. You'll pass the northwestern summit and thousands of blueberry bushes another 0.20 miles to the summit. The Western Ascent route is marked in yellow on the map above. NOTES / COMMENTS: Pitcher Mountain is one of my favorite hikes offering great rewards with very little effort. a 1941 fire burned the area leaving the summit mostly bare providing spectacular 360 degree panoramic views. On a clear day you'll have views to the White Mountains, Vermont Skyline, and even Mt Greylock in Eastern Massachusetts. The Faulkner Family Farm is home of approximately +/-50 Scottish Highland cattle raised for beef. In late July and August the summit is packed with blueberries. If you bring your own Tupperware container the Andorra Forest has a donation box at the base recommending you leave a small donation ($0.75 / Quart). The summit area is obvious however there is a benchmark disk at the summit.